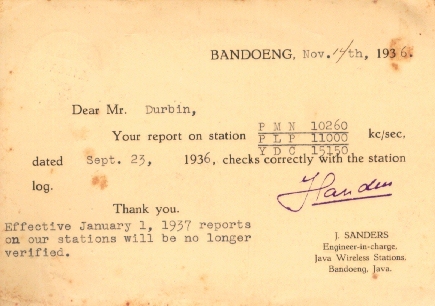 QSL card from the Java Wireless Stations PMN, PLP, YDC for a report of 23 Sept. 1936 on 10.260, 11.000, and 15.140 MHz. Java was a part of the Dutch colony of Netherlands East Indies at this time. It gained independence as Indonesia on 15 August 1950. This rare QSL card is from the collection of Richard Jary of Australia.